WARNING: I talk about injuries and burns. If that bothers you, you probably don't want to read. I promise I won't go into too much detail though, that's just icky. You know when you have these huge plans of stuff you're going to work on, and then something happens, completely by accident, to derail you for a good chunk of time? That would about sum up my Friday. May I begin with: I am the Dumbest Human Being in the Tri-City Area. Picture taken by husband. I clearly couldn't take it! You see, I somehow managed to forget ALL those handy safety tips they teach you in school. You know, stuff like "don't run with scissors", "don't lick a flagpole in winter", and of course "don't put boiling hot water on yourself." It all started when I wanted to make myself a cup of tea the morning after Christmas, sit down, and get started on FINALLY penciling Tangerine Wings #3. It was written, and mapped, and I was excited to start the process. I set the electric kettle to heat, and got myself a cup. I didn't grab a tea bag for no particular reason I can recall. I grabbed a favorite tea cup, and set to filling it a good ways full, as the water evaporates/absorbed into the tea bag when it steeps. But this time, since I forgot to get the tea bag, I figured that it was a smart idea to grab the cup by the handle, and go over to the place where i store tea. I reached into the box and that's where everything Went Wrong. The only thing I could think that I did is that as I reached upwards, I tilted the cup slightly. This caused the boiling hot water to spill over onto my left hand. The first thought I had was not "ow that's hot" it was "I CAN'T DROP THIS CUP I ONLY HAVE 4 OF THEM AND CAN'T GET MORE". But I needed to clean off my hand cause, dang, it kind of really hurt. So I grabbed the mug with my right hand, and since I was in a hurry, I splashed THAT hand with some water. I was all "DAMN SON, THAT'S HOT" but all the while thinking "CANNOT BREAK MUG!!" 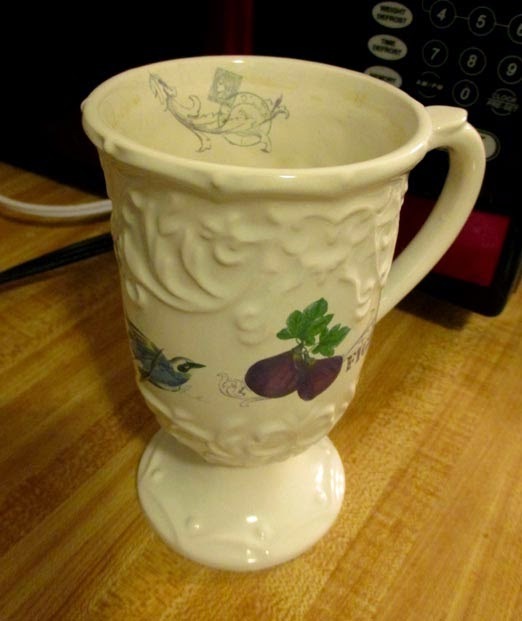 ...you see the mug was a special coffee/tea mug that I had gotten as a gift when we got married. They are very cute, and fancy, and you can't buy them from Macy's anymore that i can find. I didn't want to lose it! So I carefully set it on the floor, and went to clean my hand when I realized (I'll spare you the details) that this was no ordinary burn. I had clearly ventured into some other Burn Category. So I ran to the faucet and ran it under water. And then called Husband on the work phone. Blubbering. In shock, and finally, in a lot of pain. Long story short, Dave came home and picked me up, and we went to the nearest urgent care that wasn't a huge hospital and got taken care of. The doctor prescribed me only what I can ascertain to be 1 gallon of burn creme (it apparently only comes in travel size and Costco size), and to keep it wrapped up for a while with the creme but change it out. Since that Fateful Friday, i've learned all sorts of new ouchies and Things One Cannot Do Unless You Have Opposable Thumbs and Grip. Thankfully Dave's been helping me with things like, tying my shoes, helping me blow dry my hair (I can't hold the roll brush), let alone basic chores. Even typing is hard, since i can't move my thumb much due to the pain when it stretches a little. 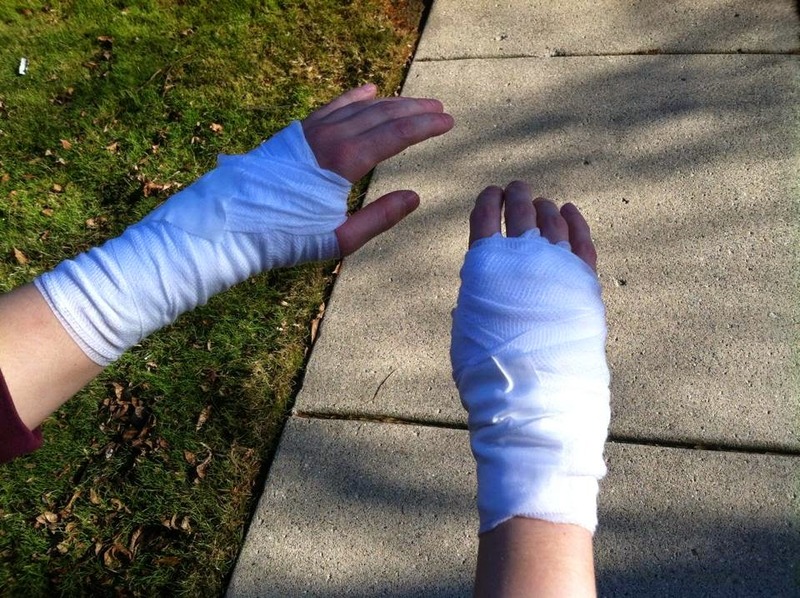 But I haven't been able to do much art wise, as the first day i was all wrapped up, and then it's hard to use the tablet buttons, as well as try to hold my paper down with my bandaged hand. I'm gonna give it a whirl today, but we'll see. ...whoops. I got so busy with things, I COMPLETELY forgot to update the blog. I'm blaming holiday busy-ness, that's my story and I'm STICKING TO IT. What else would I talk about? It's all I seem to do! But I wanted to update everybody on some changes and additions to the convention schedule (which i'll have to update that page). As you may be aware, my Convention Schedule is currently officially COMPLETE for the year of 2014. I'm kinda glad about this, because jeeeeeeez did I get tired! I've learned the hard way you really shouldn't do two shows back to back, unless you're REALLY prepared stamina wise (which I'm working on!). There maaaaay be a back to back show next year, but I'm still negotiating in my head if I want to do it. There's a couple of shows bumped off my list, and I'm just putting them here because then that way hopefully people won't ask me if I'm going to be at them anytime soon! 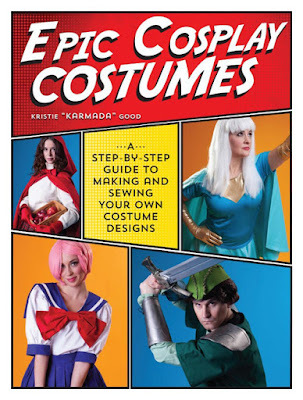 Youmacon - See Previous Post Regarding This Year's Show. I honestly would rather not go back into that whole mess, but until there's major changes (in both department and show workings), I think I'll sit this one out. I'm still going to visit and probably do masquerade stuff now that I won't be vending, but I'm not doing the table thing for a while, methinks. Midwest Media Expo - I haven't talked about this one a lot, because mainly, last year was it's first year, and while slow, my table did pretty well. I was looking forward to vending there again since it's local, but their sign up registration process really... rubbed me the wrong way. I'm okay with having to send a signed contract via snail mail (seems fair), but what I didn't like is that I also had to send the check in the same envelope at the same time without knowing if I was in or not. MMX, your staff may be trustworthy, but at least confirm if we're in before we send you money. I'll pay the extra $0.52 stamp to send it, I promise! It's all really a money paranoia on my part, so if you're going to vend at either of these yourself, MORE POWER TO YOU! In fact, if I'm around, I might even stop by your shop! I just won't be attending until other changes are made. 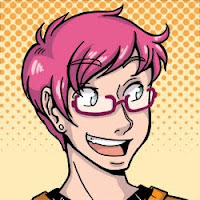 For those who are paying attention, and have been long-time readers, you probably know that Anime Central (ACen) artist alley sign ups happen around Mid-December. In fact, they were just the other day! BUT WAIT THERE'S A TWIST. The week before, ACen's Facebook page was having a "12 Days of ACen" promotional thing where they'd be giving away swag packs or a badge based on the topic they provided each day. 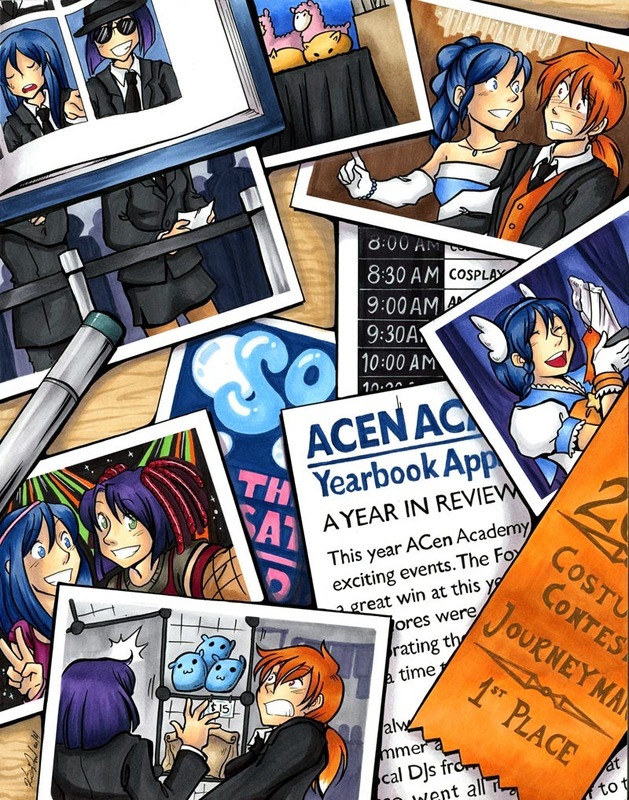 Well on the third day, they had an Art Contest - Drawing the Mascots according to the Theme provided, which this year was "ACen Academy Yearbook". The prize? A free table in the artist alley. There were two parts for the contest, the first was a "Likes" contest where everybody got to go and "like" the picture in their galleries they liked the best. The top 5 would then be considered by the judges on media, composition, etc, and then a winner would be chosen. Then, the day before the sign ups... I found out I was the winner. And for that, I am eternally grateful for this year. I don't know how much more I can explain that it really meant a lot to me. I've vended at this show for the better part of 8 years in a row (with one year I took off in 2010), so getting that as a prize was really nice. (I didn't have to battle sign ups for the first time in 8 years!) But that's all I have to say on that. I'm just really really happy they liked my work. I also wanted to give a huge THANK YOU to anybody who was on Facebook who helped advertise the contest. I'm not really on fFacebook all that well and most of the people on my lists are ones I know in real life and can still talk to (so it's very small). So thank you, Facebook peeps. BUT ENOUGH ABOUT THAT, onto the next one! 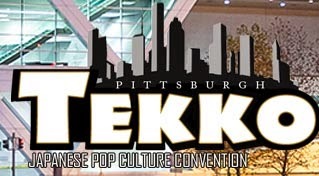 I had recently heard about this show called Tekko (formerly Tekkosho Con I believe?). It's located in Pittsburgh, PA and after doing a quick mapping, I found out it's only 4.5 hours away from where I'm at. That's closer than Anime Central! Their sign ups were the day after ACen's, and their show takes place on April 16 - 19. I have yet to hear back, but I'll keep you posted! ANIME PARK - It's a little one-day show put on by my old High School Campus, and it looks like their still gearing up, but I got contacted by them so hopefully I'll hear what the date is and see if it fits into my schedule! Meanwhile, I'm off to do some more comics and get things prepared for the next year. I CAN'T TELL YOU ALL MY WORK IN ONE POST NOW, CAN I?